Our management graduates consistently reach upper- and top-management positions in profit and nonprofit organizations. We prepare you to succeed by pairing your interests and goals with our innovative management coursework and practical experience opportunities. You'll learn the concepts and skills needed to focus a business' mission and the principles of operations and human resource management that help an organization achieve its objectives. You'll graduate with an understanding of critical skills needed for strategic management, human resources management, operations and supply chain management, organizational behavior, leadership, international business management, marketing and finance. You will have the option for a degree in management or a management degree with a concentration in global business, human resources or operations. Academically active and industry-experienced faculty members teach the latest techniques for keeping pace with the changing business world. You'll learn in small classes taught by faculty qualified in their disciplines and active in research. The latest tools and technology are available to you in Centennial Hall. Centralized advising, career guidance and counseling services give you easily accessed support. All Herberger Business School majors complete core classes in accounting, economics, mathematics, communication, technology, law, ethics and financial principles. 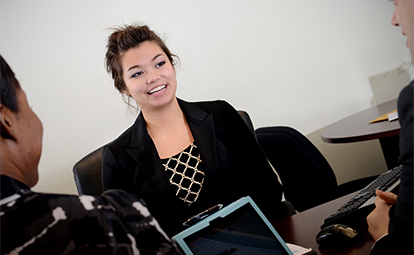 Business Honors Program provides opportunities for driven students to engage more closely with like-minded peers and professors. Herberger Business School is accredited by the Association to Advance Collegiate Schools of Business (AACSB) at the bachelor’s and master’s degree levels. The Business School has been accredited for more than 40 years. Student organizations (APICS and SHRM) consistently receive awards from their respective national organizations. Student organizations (APICS and SHRM) consistently place well in regional case and paper competitions. The Operations program is the only one in Minnesota State in an AACSB-accredited business school. The Human Resource program is one of the first in Minnesota to be recognized by SHRM as aligning with their Curriculum Guidebook and Template.